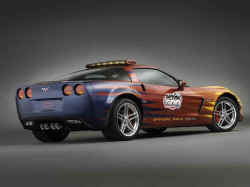 A specially-outfitted 2006 Corvette Z06 will serve as the official pace car of the 48th running of the Daytona 500, on Feb. 19. "Tonight Show" host and auto enthusiast Jay Leno will drive the pace car. The Daytona 500 is NASCAR's premier race and traditionally kicks off the NASCAR Nextel Cup racing season. 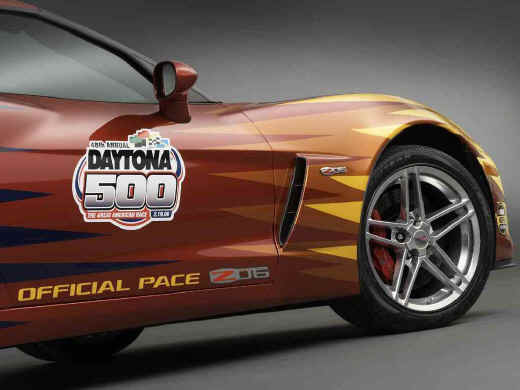 Selection of the Z06 model marks the second consecutive year that a Corvette has been selected as the Daytona 500 pace car. "It is a wonderful honor to have Corvette serve once again as the Daytona 500 pace car," said Ed Peper, Chevrolet general manager. "Chevrolet has a long, successful history at Daytona and there's no better vehicle to showcase our performance legacy than the Corvette Z06 - a car that was born on the race track." The Corvette Z06 that will serve as the Daytona 500 pace car is mechanically identical to those available at Chevrolet dealerships. It is the fastest vehicle ever offered by Chevrolet and General Motors. With 505 horsepower (377 kw) and 470 lb.-ft. of torque (637 Nm) from its 7.0L all-aluminum, racing-inspired engine, the Corvette Z06 leaps from 0-60 mph in 3.7 seconds and has a top speed of 198 mph. It also differs from other production Corvette models with extensive use of lightweight materials, including carbon-fiber front fenders and a chassis comprised of aluminum and magnesium. A racing-ready suspension and large, 18-inch front wheels and 19-inch rear wheels help keep it glued to the tarmac, so it requires no drivetrain modifications to satisfy its role in front of the racing pack. In its official capacity, however, the pace car is outfitted with a variety of safety equipment and highly visible strobe lights. Interestingly, the Corvette Z06's 505-horsepower (377 kw) output is actually more than the power produced by the race cars that will compete in the Daytona 500 - a first for a pace car. This is because of the unique "restrictor plate" rule established for the Daytona and Talladega , Ala. racetracks. On these 2.5-mile-long super speedways, the restrictor plate reduces airflow into the engine to limit horsepower and keep race car speeds below 200 mph. With a restrictor plate, racing engine power is reduced from about 750 horsepower to about 450 horsepower. Race cars can still average more than 190 mph on Daytona's long straights. The Corvette Z06 Daytona 500 wears a unique paint scheme, inspired by the hot-to-cool color transition of a space capsule entering Earth's atmosphere at a high rate of speed. The paint scheme is carried out with an elaborate, interlocking scallops design - a twist on hot rod-style flames - that blends "hot" Lemon Drop yellow at the nose of the Corvette with Lemon Glow, Amber Ecstasy, Blazing Copper and Hot Poppy. The colors culminate with a cool Sapphire Trance blue color at the rear of the vehicle. DuPont, the sponsor of Jeff Gordon's No. 24 Monte Carlo, supplied the colors, which are from the company's "Hot Hues" line of automotive paint. "As if the Corvette Z06 needed help in looking fast, the intricate paintwork of the pace car gives it the appearance of tremendous speed," said Peper. "It is one of the most elaborate and stunning vehicle designs we've created." Jay Leno, host of the "Tonight Show" and an unabashed auto enthusiast, will drive the Corvette Z06 during opening ceremonies and the pace laps that start the race. Leno, who has a large collection of vintage automobiles and motorcycles, has previous experience as a pace car driver. Chevrolet returns to the Daytona 500 with 18 victories - the most of any manufacturer - including last year's champion Jeff Gordon. Chevrolet also returns as the defending manufacturer's cup champion, an award that has been bestowed 29 times. Also, defending Nextel Cup champion Tony Stewart drives the No. 20 Chevrolet Monte Carlo for Joe Gibbs Racing. "The Corvette Z06 already is a performance legend and the fans will enjoy seeing it lead their favorite drivers around Daytona's famous tri-oval," said Robin Braig, president of Daytona International Speedway. "It promises to be a great race, and kicking it off with a Corvette at the head of the pack is the best way to start."